Construction: 3 skins cold laminated Doug Fir. This week we are featuring Impeccable, owned by veteran sailing legend John Walker. Combined age of crew and boat is 118 - a record that may only be beaten by another famous veteran of sailing Tig Thomas who we featured last month. We may have to do a month by month count back. Impeccable is a Timber Cold Moulded yacht designed for John Walker by Doug Peterson to the IOR Rule. Built in Sydney by Doug Broker in 1980. 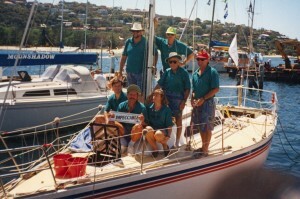 Impeccable has been raced successfully offshore at MHYC as well as CYCA, winning MHYC Gillawa Shield in 83/84, 86/87 and again in 1990/91. Impeccable and John were a member of MHYC team winning CYCA Commodore Cup in 1990/91, 91/92 & 92/93. Impeccable competed successfully in number of Mooloolaba and Lord Howe Island races winning both of them in 2004. Mooloolaba on IMS and IRC and Lord Howe Island on IMS against a field of around 20 boats. The same year John was nominated for the 3rd time as Veteran Skipper of the year. John retired from long Ocean racing at the age of 86 in 2008 after completing his 25th Hobart race all of them on Impeccable. John has attracted a long term dedicated crew. Leaving a lot of the deck work on long ocean races to his crew, John's secret weapon to his success is his navigating skills. His uncanny knack seems to be picking the right winds and current. This skill saw him winning the MHYC Navigator's award in 2009. At present John Walker races Impeccable at MHYC in No 1 inshore division.